Upon further review of the Titans game, Mike Pollak looks much improved since his four game benching. In this last game, he actually approaches average! Of course just being close to average gives him better grades than the rest of the offensive line generally earns. He does not seem to have gotten any stronger, but his run blocking technique is better and he actually got some movement on the guy he was blocking on several key runs Thursday night, something he rarely has accomplished before. When protecting Manning, he was less hazardous to life and limb than Jeff Linkenbach - but that is not saying much. Of course it would be quite unfair of me not to describe Linkenbach's good performance in the 2nd half at left tackle, replacing the injured Charlie Johnson. Linkenbach was always intended to be a tackle for the Colts and the experiment of playing him at right guard was a miserable failure. But at tackle he has looked good. Daniel Muir had another good night against the run. He has had a good year penetrating the offensive line and generally being a hard to control pest. Pierre Garçon drew a lot of criticism for his performance earlier in the year. It is true that he was not playing well, but being called "lazy" and "timid" was uncalled for. When you see a player on the field not coming close to performing as well as you remember, your first thought should ALWAYS be that he is playing injured. If he is not on the injury report and continues to play below his previous level, your second thought should ALWAYS be that he is playing injured. Now that Garçon's secretly strained hamstrings have healed, he is looking a lot like he did in last year's breakout season. Learning how to play through pain is a challenge for young players, and it affects some more than others. That brings us to Donald Brown. I think he came back still injured due to Addai and Hart being unable to play. For several weeks he looked slow, tentative, and generally unlike the player we saw flashes from last year. He has looked better each of the last three games and is starting to show us why the Colts spent a 1st round draft pick on him. The Colts never intended him to be a every down move the chains type of back. He was brought in to be a change-up to Addai's fastball. 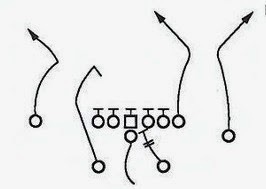 To run draws and screen plays, to flex out to WR on occasion. Both him and Addai have been almost continually hurt, so we have never really been able to see this dynamic. Even though he seems to be healed up, our truly terrible offensive line is preventing him from really showing us what he can do. But the flashes are there. I think he will be ok. So how did Pollak get his groove back? How can you tell he got it back? I think only he and the coaches would know for sure. Mainly he is playing with more power.